A cataract is an opacity due to degeneration of the lens of the eye. As we age there is a normal degeneration of the lens of the eye, which starts in a very subtle way in the 50’s or 60’s and gradually deteriorates with further aging. At the time when the cataract is getting so dense that prescription eye glasses or contact lenses will not correct the loss of vision that is associated with this. The eye specialist will recommend cataract surgery where the cataract is removed and replaced with a plastic lens or silicone lens. There is a progressive loss of vision without pain. Light sensitivity often is a problem, particularly very bright lights. Night vision is unreliable with complaints of being blinded by oncoming traffic. There will be a need for more changes in prescription glasses or contact lenses. In some cases where there is swelling of the lens there can be an associated glaucoma, in which case there would be pain in the affected eye. Before the eye specialist dilates the pupil the intraoccular pressure is measured. An eye examination is also done to rule out a narrow angle in the anterior eye chamber, which could increase the intraoccular pressure and would be a sign of associated glaucoma. 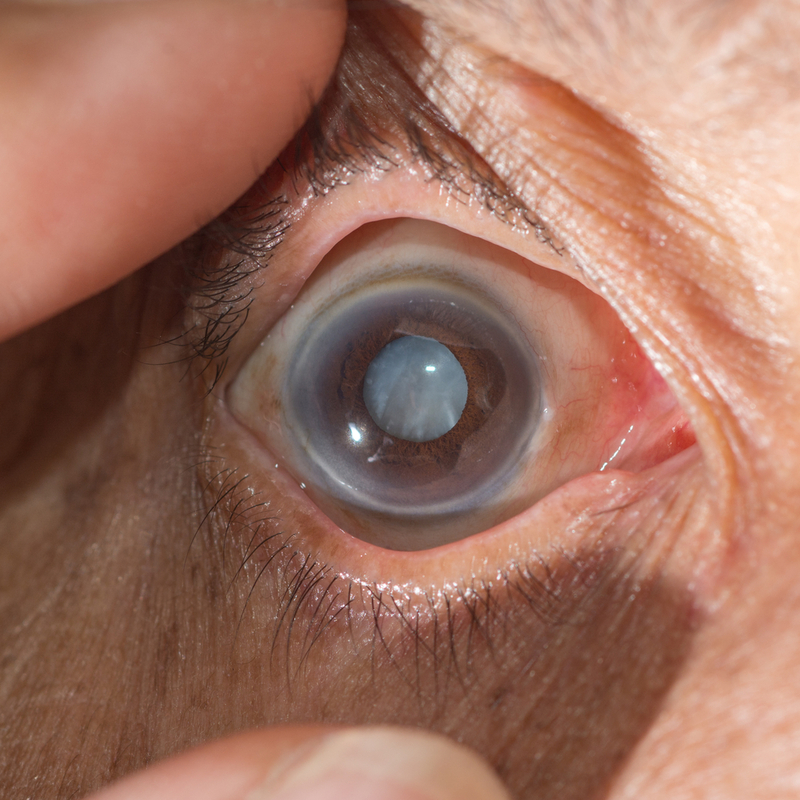 A cataract can be seen as a gray or brown/yellow opacity in the lens using slit lamp examination. There are also inborn (congenital) forms of cataracts in children. Here are more findings for various patients with cataracts (see images). Before cataract surgery is contemplated, the eye specialist has to exclude conditions such as macular degeneration, glaucoma and some other conditions that would not respond to surgery. With a prescreened population like this the success rate for cataract surgery with lens implantation is about 95%, one of medicine’s most rewarding success stories. The procedure is done on an outpatient basis under local anesthetic. Cataract surgery is done using a local anesthetic in combination with intravenous sedation. Cataract removal (called “cataract extraction”) is usually always combined with an intraoccular lens implant where the old lens is replaced with an artificial lens (made of plastic or silicone material). Following the surgery the patient is put on prophylactic antibiotic drops and corticosteroid drops for a period of about 4 weeks after the surgery. This keeps the swelling following the surgery to a minimum and prevents infection. Quite often the patient will not need glasses after the surgery. A minority of patients will need very weak prescription glasses or contact lenses following this surgery to achieve perfect vision. More information on how vegetables prevent cataracts in this blog. New developments of how to get rid of contact lenses, glasses and cataracts are described here.